JRP Electrics Australia provide clean, reliable, quality, affordable and safe electrical services. We are a small local company, based in the Sutherland Shire, and servicing a range of areas across Sydney. JRP Electrics Australia offer a range of electrical services including domestic, commercial and strata electrical work. 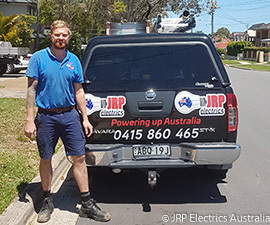 John at JRP Electrics Australia has had over 10 years experience in the industry. JRP Electrics Australia pride ourselves on being prompt to appointments. Our licensed and insured electricians also use all quality parts and provide workmanship guarantees on parts and labour. We offer a range of services. For example, wiring for new homes, switchboard and safety switch upgrades, installing extra lighting and power points to existing homes and offices, lift maintenance and many other electrical services. In addition, we provide 24 hour 7 day a week service. Contact us today for a free quote.